Let’s face it – squirrels are funny little guys. They don’t carry rabies or other serious infections, as many of us believe mistakenly. Feeding squirrels is a great way to understand a bit more about those cute animals and learn the mysterious ways of nature. So, you’re considering the addition of a squirrel feeder to your backyard. That’s great! You may still be uncertain about its placement and wondering why people give it a try. Worry not, we have a list of reasons why having a squirrel feeder in the yard is such a great idea. Here’s the number one reason. 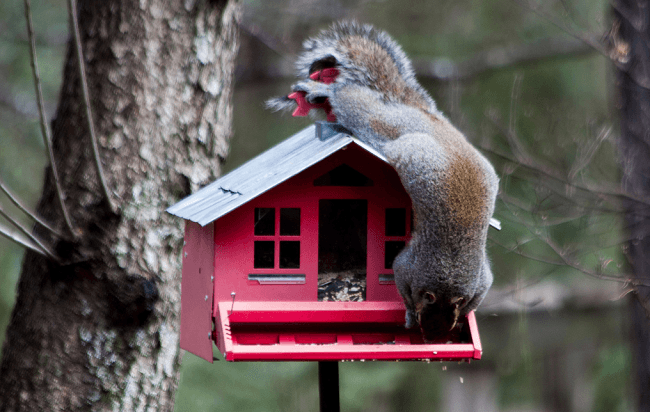 The practical benefits of having a backyard squirrel feeder are the first ones to examine. Squirrels, just like all other animals, play a role in nature. They are seed and spore dispersers. When getting ready for the winter, squirrels like to stack up on seeds and nuts. They burry the supplies in the ground and keep them there for eventual use in the future. The only problem is that squirrels will often forget where they’ve buried things. Many of the nuts and seeds that squirrels forget in the ground will sprout and grow. These can turn into beautiful trees. Whether squirrels bury their supplies in your garden or simply out there, you’re helping for the preservation of greenery. This is an important natural process and you should be proud about your participation in it. In the absence of a food source, squirrels will raid fruit and vegetable gardens. This is one of the main reasons why so many people hate the little fur balls. 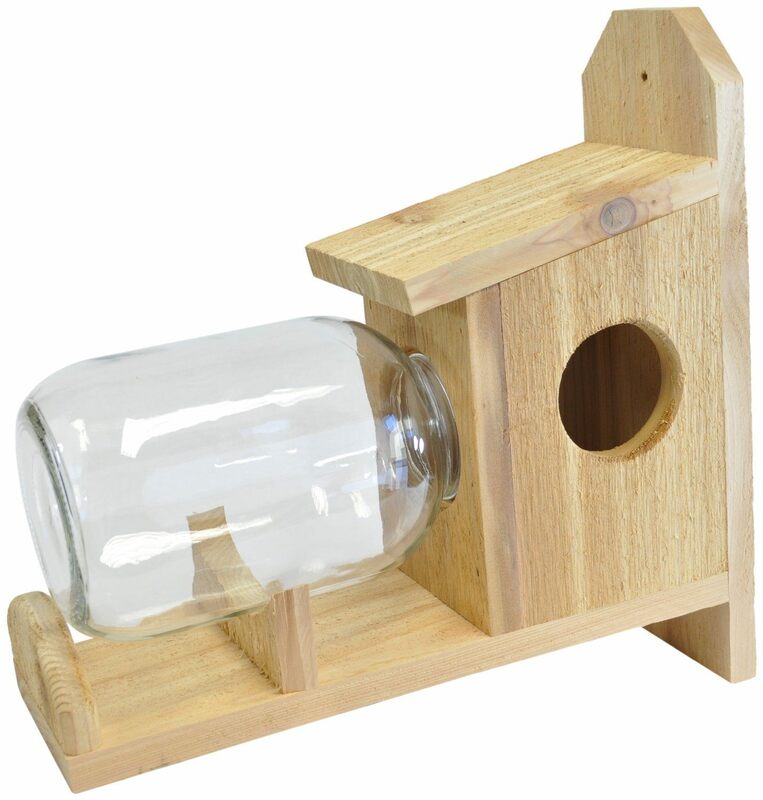 The placement of a squirrel feeder in the yard is one of the most humane pest control options. When squirrels have enough food, they’re not going to express any interest in the fruits and veggies that you’re trying to grow. Maintaining a squirrel feeder is quite inexpensive. There are nut and seed mixes or you can simply buy corn for the purpose. If you feel bad about trapping or killing squirrels, you’ll definitely be satisfied with the placement of a feeder in the backyard. Have you ever observed squirrels eating food or interacting with each other? These little guys can be truly hilarious. Do you need a bit of comic relief in your life? If so, buying a squirrel feeder is definitely the right decision for you. Squirrels are really bold and they may even try to intimidate you. Let’s face it – these attempts can bring tears of laughter to your eyes. If you don’t believe what I’m saying, go to YouTube and watch a couple of squirrel videos. All of the evidence is available there. Attracting any kind of wildlife to your backyard can teach you valuable lessons. As technology advances, we seem to be losing our connection with the great outdoors. Squirrels are relatively friendly and they will not get scared when you observe them. If you’re into photography, you will have a lot of fun shooting squirrel pictures. The little animals are very energetic and you’ll definitely have at least a few great pictures as a result of every single photoshoot. Having squirrels in the backyard will also be great for your children. It’s a real-life illustration of what nature is all about and how wild animals survive. Little ones can participate in the process, add more food to the feeders or get them cleaned occasionally. Such participation will make kids feel useful and teach them how to be responsible for the wellbeing of another living creature. Squirrels are non-aggressive creatures. They will go on the offense solely if they feel threatened. Position squirrel feeders in spots where their presence isn’t going to affect your gardening activities. Make sure that the feeders are always filled. To have a bit of fun, you may want to choose a variety that will test the intelligence of squirrels and get them crafty. That’s all it takes to get squirrels comfortable with your presence. In the beginning, they’ll probably run off when you come out in the yard. With the passage of time, you’ll get an opportunity to do some closer observation.